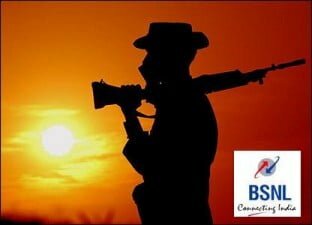 Bharat Sanchar Nigam Limited (BSNL), India’s largest integrated telecom service provider has launched Special Tariff Plans for Paramilitary Forces serving the nation. With these special tariff plans, BSNL endeavors to benefit over 9 lakh Paramilitary jawans. The two plans launched are the Paramilitary Plan and the Officer Plan for the jawans & officers respectively. With daily free talk time for 20 minutes on any two BSNL numbers, jawans can talk with their own family, anywhere in country under the Paramilitary Plan.The facility is also free of cost while on roaming. Other than that the Paramilitary Plan offers Reduced Calling charges at 0.20 P/ min on any two BSNL numbers; be it mobile or landline. Another plan in the offing is Reduced Calling charges at 0.30 P/ min on any one BSNL number to talk with a relative, anywhere in the country. The Paramilitary Plan is available both on 2G and 3G along with reduced video calling charges at 0.70 P/ min. Apart from this, an economical plan has been launched with Fixed Monthly Charges of Rs.99 (Tax Inclusive), where one can enjoy Per Second Pulse and tariff beyond freebies at 1 Paisa / Sec. Out of Rs.99 of Fixed Monthly Charges, apart from facilities mentioned above, the jawans can also avail additional talk time worth Rs.75 per month. For control on expenditure, BSNL has also launched a pre-paid plan, whereby jawans can recharge their mobiles using by vouchers. Under the Officers Plan, serving officers can avail unlimited free calls to any BSNL numbers within a circle and 500 free SMS, both Local & National. Besides this, they can avail 1500 minutes / month free STD calls on any BSNL numbers. This also includes 300 minutes of free I/C roaming call and 200 minutes of free O/G roaming call. The other features of the plan include per minute pulse, free night calling on one’s own network, unlimited free GPRS in Home LSA, STD calls at 0.40 P / min, video calls at 0.70 P / min. All this comes at a fixed monthly charge of Rs.425 + Taxes. Speaking on the Special Tariif Plan launched for Armed Forces Personnel, Mr R. K. Upadhyay, Chairman & Managing Director, BSNL said, “BSNL has always endeavored to provide the most competitive plans for all its customers. We at BSNL wanted to treat our jawans & officers serving our nation with some smart yet easy-on-the-pocket kind of schemes. The special tariff plan has been launched with an aim to bring a large number of these jawans & officers to actively use and experience our entire bouquet. it is a good plan but bsnl have to make it better and best.